Description: The foundation of Amanda Curtis's very existence cracks the moment she discovers the woman she thought was her mother has never given birth. Where she belongs is a question she can't put to rest. But when the clues lead her to a charming yet chilling small town, the threat against her begins to unfold. Trey Addison is a fixture in Echo Falls. The town and the people are his to protect. He was born to take his place in the family legal firm, but now that a stranger desperate to unlock her past is depending on him, he's forced to make an impossible choice. If Trey doesn't protect Amanda, she'll walk straight into a deadly trap. If he helps her expose the secrets that haunt her, the truth could shatter them both. Why I Picked This Book: I really enjoyed a previous book by Perry and wanted to read more from her. The mystery is so compelling. I can't imagine discovering completely out of the blue that my mother wasn't my mother. I thought Amanda's reaction was pretty natural. It'd be impossible to just sit and let lawyers sort everything out. I liked Amanda. While taking a more active role in the investigation probably isn't the smartest decision it's completely understandable. As well I liked that she's a veterinarian with experience with large animals and owns her competence. She jumps in when needed and while she is respectful to the other older vet she doesn't dismiss her own skills. She's also aware and respectful of Amish customs but doesn't make a big deal about it. Echo Falls is an interesting town. I enjoyed the mix of Amish and English as well as just the regular small town rumor mill. I'd like to revisit this setting. This book is fast paced and incredibly readable. I was caught up in the story pretty quickly and just flew through this read. I liked how everything wrapped up. You could probably argue that everything is wrapped up a little too cleanly but it worked for me. While I did enjoy the pacing and the writing style there's an overwroughtness about the book that I didn't love. It felt like the intensity and emotions of the characters was always on max. The romance was a bit quick. I'm all about an instant connection and instant attraction but this bordered a little too much on the devoted insta-love for me. Overall, this was an enjoyable read for me with an intriguing plot, an unusual setting, and likable characters. While it didn't blow me away it kept me engaged and turning pages far later than I should have been! Would I Read More of this Series/Author? I would though she probably isn't an auto buy for me. However, if I saw one in the library or a new one on NetGalley I doubt I'd be able to resist! Would I Recommend this Book? If you're in the mood for something on the lighter side but not necessarily a comedy this would be a pretty good pick. I've never read this author before, but I have been extra into romantic suspense this year. I'm still madly in love with Katie Ruggles books. You should totally look into them - I think you would like them. 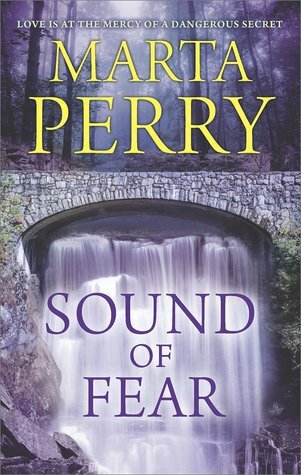 I read a Marta Perry years ago, and had a similar reaction: I liked the story and the characters, but it was a bit—I'll use your word and say overwrought, as it's better than any I've come up with. Still, this sounds like an intriguing read. I like romantic suspense but I agree about insta-love (takes me out of the story). I'm glad you found the read intriguing though. I really like how you describe this book - makes me want to read it, in spite of the insta love which is always a bit of killjoy. Great review, Katherine. I do love the premise - it would be awful if I suddenly discovered that my mother wasn't... Though I take your point about the emotional intensity being dialled up very high throughout. This sounds like something that I would pick up. I am glad that you enjoyed it even if you had a few issues. I can't imagine being in that situation either--although I know of people who have discovered their father wasn't their father later in life--but that's a bit different, isn't it? This does sound good, even with the minor flaws you mention. I am glad you enjoyed this one overall. Thank you for your great review!